I loved Big Magic and Jamaica Inn. I am glad I read the others although they were not my favorites. Overall though I was happy to see a mix of non-fiction, mystery, and a book from indie press, Two Dollar Radio. I’m carrying over a few reads into February and I’m determined to finish at least one before I start a new book. It shouldn’t be difficult as I’ve got two that are absolutely fantastic but I’ll tell you about those in another post. The only thing that was disappointing with my books this month was that I wasn’t able to complete the Japanese Literature reading challenge hosted by Dolce Bellezza. I’m still in the middle of the novel but just won’t get a chance to finish it. Looking forward to February, there is #ReadSoulLit instagram challenge, InCoWriMo and plenty of new book releases hitting the shelves. How about you, how was your reading month and what are you looking forward to in February? I need to try Gilbert’s Big Magic. I loved all of DuMaurier’s books when I read them years ago, but there are some I would enjoy rereading, especially My Cousin Rachel. 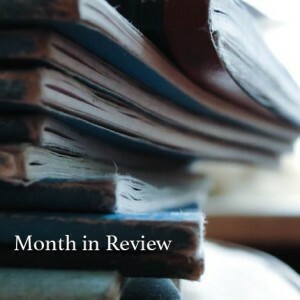 My favorite January reads were Grief Cottage by Gail Godwin and The Weight of Night by Christine Carbo. I loved Big Magic too; I was expecting it to be so-so but something about the tone really connected! Good books! I read Jamaica Inn a long, long time ago but remember enjoying this and Rebecca very much. I read (and watched) Eat Pray Love, and despite some author-bashing by many bloggers about “EPL” … I really liked it! I never heard of Big Magic, but will check it out, thanks. Yes, January felt like a very long month. I only managed to read two books, I was so distracted. Maybe February will be better? Big Magic sounds like a winner and a lot of readers have given it high praise. I don’t read a lot of Self-Help/Personal Development type books, but I may give this one a try. Have a good weekend, Iliana! January really was a long month. It always is for me (as is February despite the amount of days), but this year it seemed longer still. I really want to read Jamaica Inn by Daphne Du Maurier at some point. Or anything by Du Maurier. I hope you have a great February! Jenclair – I actually wouldn’t mind doing a re-read of My Cousin Rachel. Such a great story.Have you seen the film version? I think there’s going to be a new one soon. Joann@Lakeside Musing – Oh yes, it did. So glad we’ve moved on to a new month! Melody – I really loved it! Buried In Print – I know how that goes when you end up carrying over so many books from a previous month but that’s awesome that you got one of your shelf-sitters read! I thought Beloved was hard to get into but would love to read more of Toni Morrison. Rita@View From My Books – Unfortunately I never got around to Eat Pray Love because of all the hype but I would like to read it. I did see the movie and thought that was fun so I wouldn’t mind checking it out. Les In NE – I don’t tend to read a lot of books like this either but since it was on creativity I thought why not and I especially think this would be a good one for someone who needs that extra little jolt of inspiration/encouragement. Literary Feline – Me too. I think it’s just so hard to get over all the excitement over Christmas and New Year and then it’s just winter and no more holidays for a while. Here’s to a good February!